· To monitor and campaign for laws and government policies concerning the protection of plant variety and local people’s intellectual rights. · To promote and support local communities to protect community rights on biological resource conservation and to develop local people’s intellectual propertyrights for sustainable plant variety resource management. · To build and support networks of people’s organizations in Southeast Asia to protect biological resource and local people’s intellectual property rightshts. Since 1999, Terre des Hommes has supported many projects and activities to bolster biodiversity in countries throughout Southeast Asia. The 2000 annual regional meeting of the Terre des Hommes Regional Partners’ Working Group on Biodiversity was used to encourage reflection and evaluation, to assist in developing a regional strategy and facilitating moving forward together in a more effective and cohesive way. Since 1999, terre des hommes has supported many projects and activities to promote biodiversity in countries throughout Southeast Asia. The 2000 annual regional meeting of the terre des hommes Regional Partners’ Working Group on Biodiversity discussed ways on how move forward in a more effective and cohesive way. At the annual meeting in 2007, the Working Group on Biodiversity decided to introduce a new focus on rivers and local communities. The Campaign Our River’s Our Life was decided upon. This campaign has worked closely with communities affected by river degradation to protect and conserve river ecosystems in South East Asia. Children and young people are actively recruited and their participation is strongly promoted in the campaign’s activities. Since its beginnings, these coordinated efforts have achieved a great deal for communities across the region. The following are a number of campaign highlights from the ongoing campaign. A children’s congress. The first alternative children’s congress was held in October 2007 at two cities, Davao and Ozamiz, in the Philippines. The 291 boys and girls that attended the congress ranged in age from 7 to 18 years old, and represented a range of ethnic groups, Christian/Visayan settlers, indigenous groups from Mindanao and Maguindanaon Muslims. The congress focussed on deepening the children’s understanding about their rights and biodiversity issues. Creative expression through visual arts, theatre, song, dance and other performances allowed the children to formulate and enact their views on biodiversity. They worked together to develop a collective children’s declaration on biodiversity which the children promoted in the media. Reinvigorating traditional ceremonies. In Thailand , Myanmar and Cambodia there are strong local traditions related to the acknowledgment and honouring of the natural resources used in traditional ways of life. 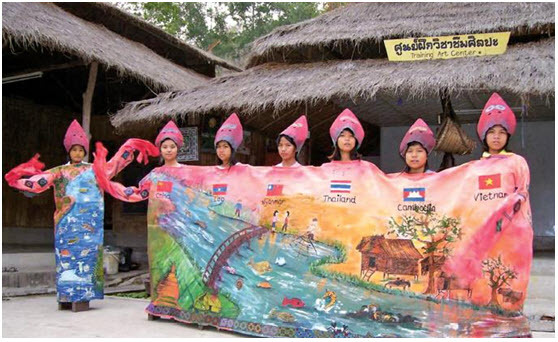 The Our Rivers, Our Life campaign has supported the communities who have taken these traditions and used them as part of their activities to raise awareness about river and biodiversity issues. These ceremonies often involve traditional leaders as well as Buddhist monks and where appropriate other religious representatives. The ceremony centres around the symbolic releasing of local fish back into the river. The fish represent the return of life, hope and balance and are seen as an offering that enriches the river and its ecosystems. Building strong networks. One of the mandates of ‘Our Rivers, Our Life’ country members is to work to improve and enlarge local networks. One of the key groups to build relationships with, is the local authorities. It is often these bodies which have the power to improve regulations pertaining to river use and more importantly to enforce these regulations. Through inclusive community education programs and awareness training have helped foster more open discussion between local decision makers and communities, resulting in stronger involvement of local communities in policy development and policy enforcement. In Cambodia a strong link has been forged with local Buddhist monks who actively participate in many of the campaign activities including being guest speakers at events and helping to lobby local authorities about river issues. Buddhists monk participation adds both authority and legitimacy to the advocacy work carried out in Cambodia. In 2009 RWG was able to report work that had occurred with 33 network partners, 23 government bodies, 38 communities and 49 schools. In particular, project partners have been able to expand their networks with other groups who are working on similar issues such as environmental education, climate change, river and biodiversity protection. Expanded networks have also strengthened relationships with communities and local authorities in wider areas at the country level.